Rice salads are far from boring. They are also delicious, healthy and can be made in a short space of time. First cook the rice, after first washing and rinsing it, then, once cooked, rinse in cold water and set aside to allow it to cool off. Next take the peppers and remove their seeds before slicing them into thin sections. Once you have done this take the tomato and slice this into wedge shapes. The next stage is to take the spring onions and finely chop them along with the parsley. After this has been completed take your black olives and remove their stones. Now mix everything with the cooked rice. Take the lemon and, after ensuring all the pips have been removed, squeeze all the juice out of it and mix with the salt, pepper and olive oil. Next take the garlic and blend together until the mixture has a smooth appearance. Once this has happened you can gently drizzle it on the salad, ensuring everything receives a sufficient coating. First cook the rice and once cooked drain it and add nutmeg, pepper and oil to dress it. Next add the white wine vinegar. 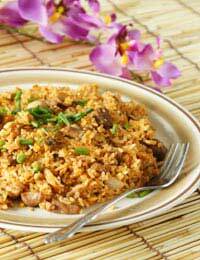 Once you have done this take the cooked chicken and stir it into the rice along with the mushrooms. Serve immediately if you want to eat it warm or place in the fridge to eat later. First take a large saucepan and fill with water before placing the rice and apple juice inside. When the water has been brought to the boil, simmer for approximately half an hour before leaving the rice to cool. Next take a mixing bowl and place inside the courgette, lemon juice, chopped apple and sweetcorn. Next mix well together. Once you have done this tip the rice into the bowl and gently mix together. To make the dressing to go with your salad take the pepper, 1 tablespoon of salad dressing and 1/2 a tablespoon of wine vinegar and place inside a jar with a lid that can be well affixed. Shake the contents until they are well blended. Once this stage has been completed gently pour over the rice, which should now be on a serving dish, along with the yoghurt. If not ready to be served immediately, cover and place in the fridge.